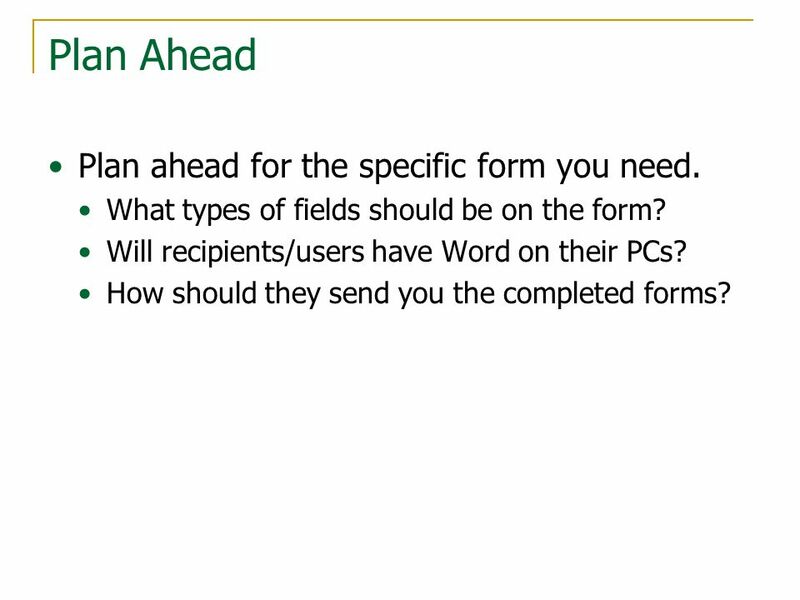 Creating Forms in Microsoft Word Lunch and Learn: April 2, 2008. 2 Plan Ahead Plan ahead for the specific form you need. What types of fields should be on the form? Will recipients/users have Word on their PCs? How should they send you the completed forms? 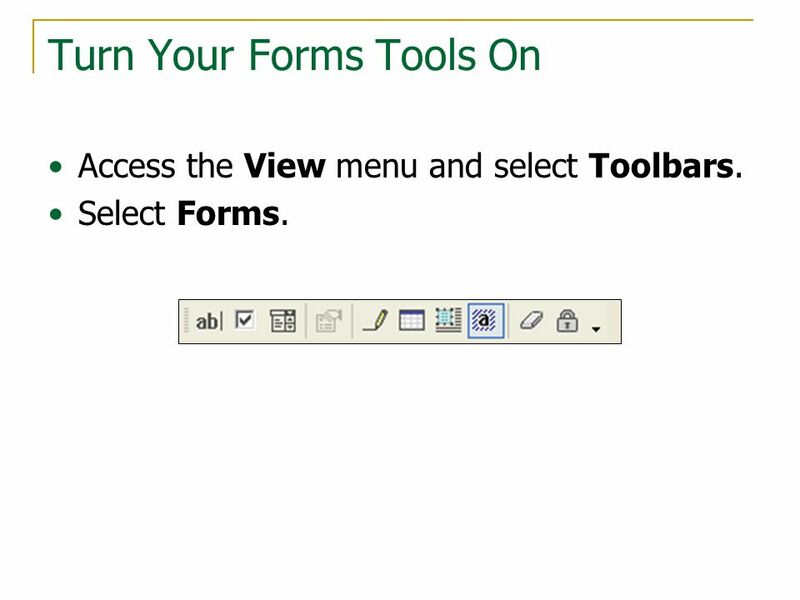 4 Turn Your Forms Tools On Access the View menu and select Toolbars. 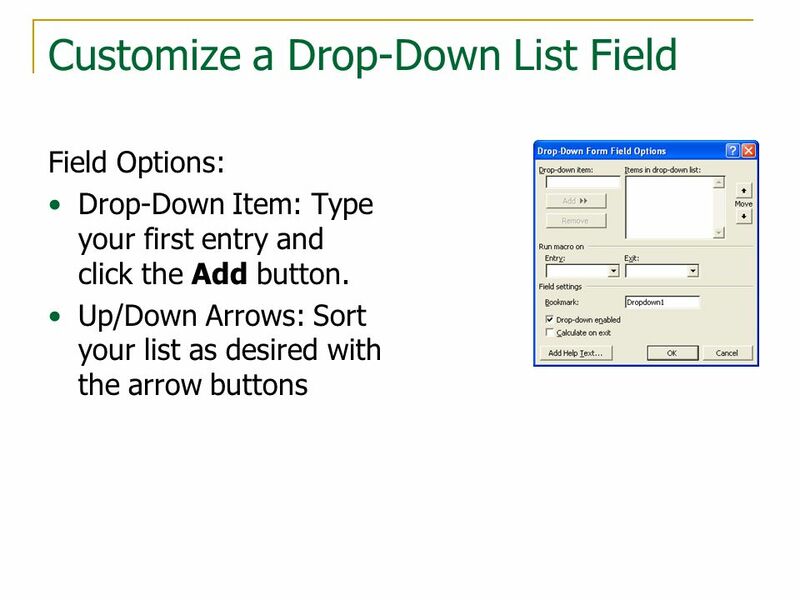 Select Forms. 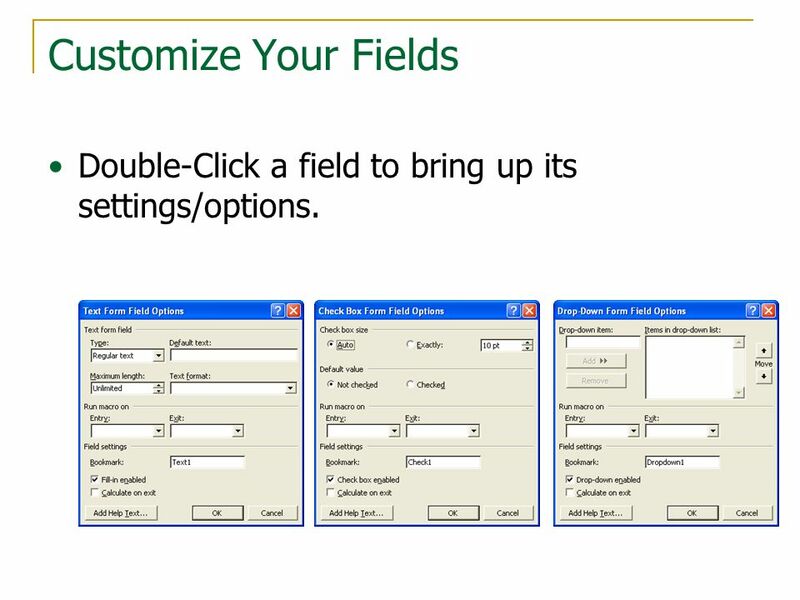 6 Customize Your Fields Double-Click a field to bring up its settings/options. 10 Lock Your Form Lock your form to protect it from accidentally being altered. This isn’t for security as much as it is a safety net. 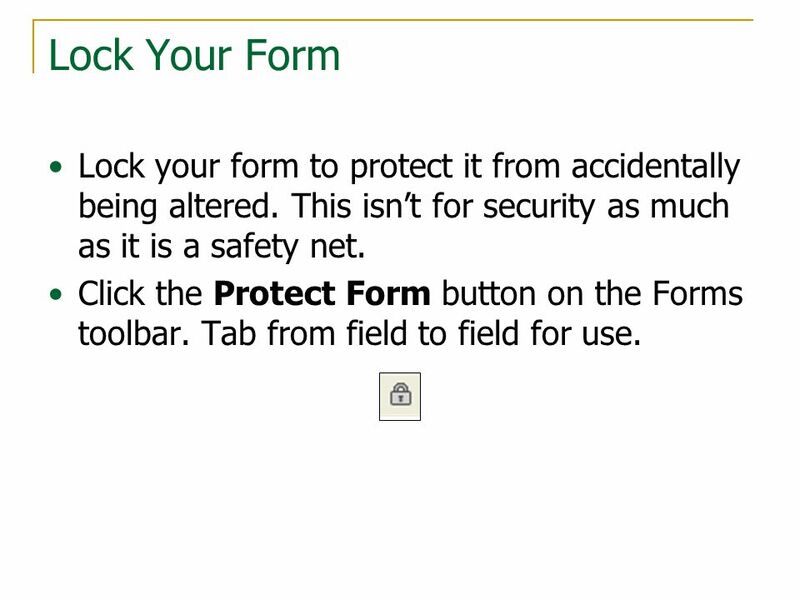 Click the Protect Form button on the Forms toolbar. 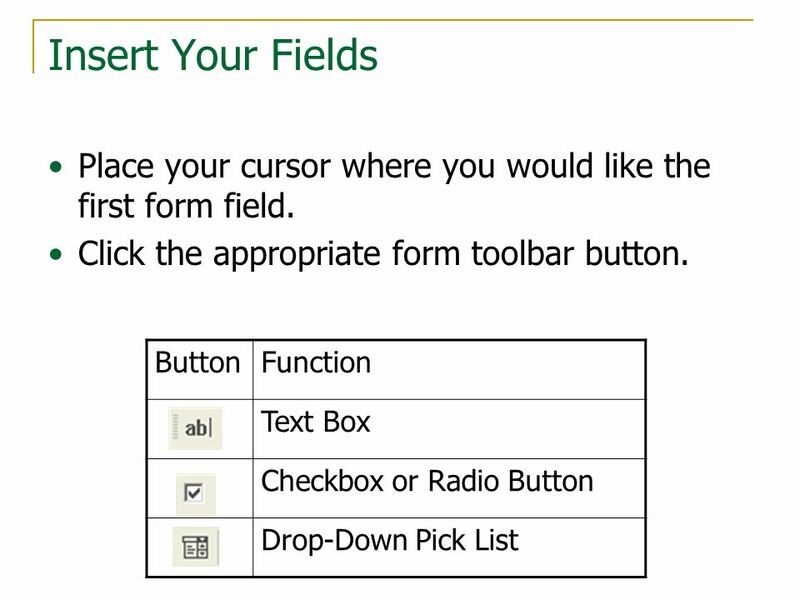 Tab from field to field for use. 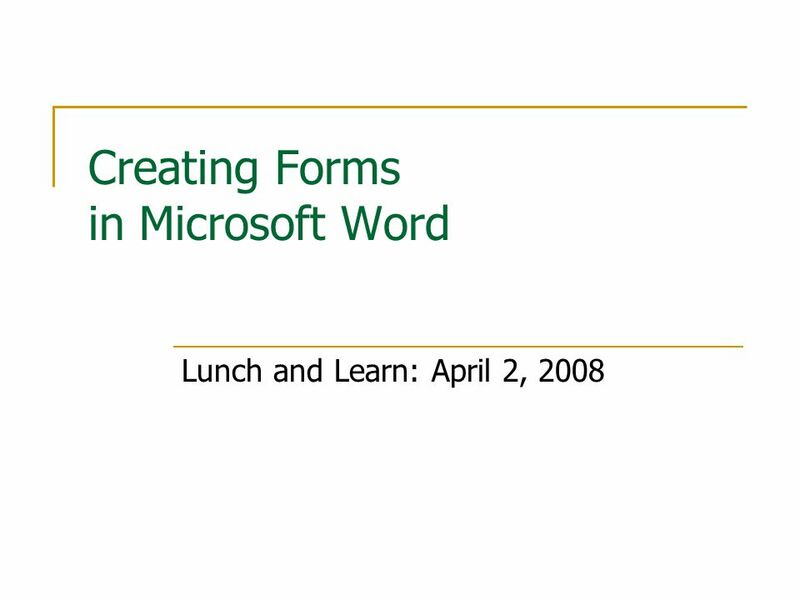 Download ppt "Creating Forms in Microsoft Word Lunch and Learn: April 2, 2008." 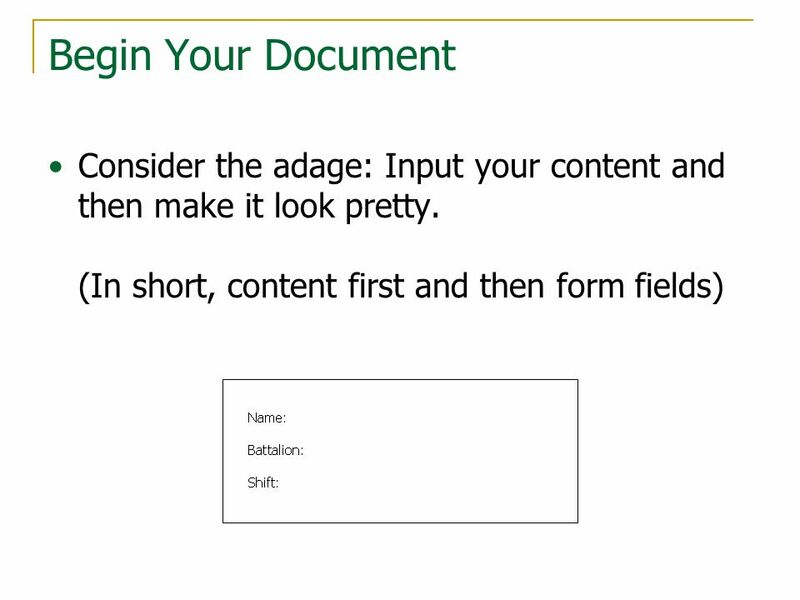 1 After completing this lesson, you will be able to: Check spelling in a document. Check for grammatical errors. Find specific text. Replace specific text. 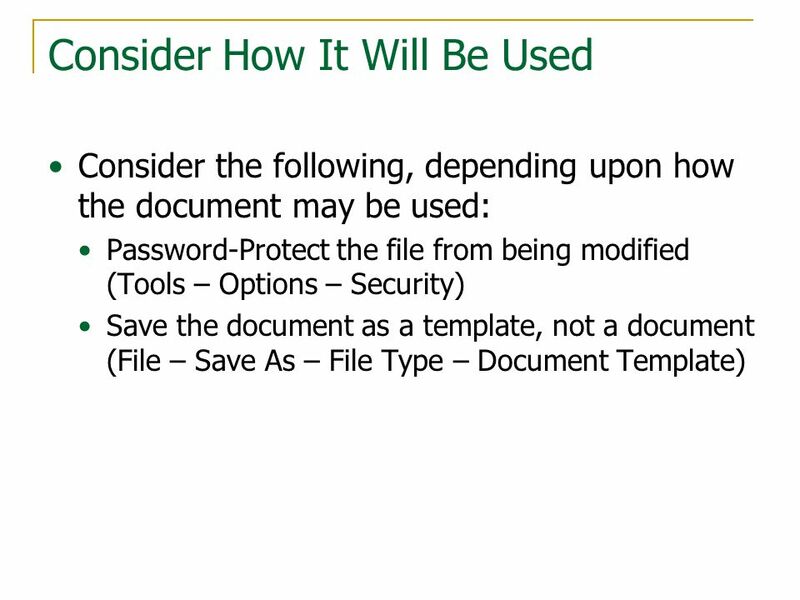 Document Properties: adding information to your Microsoft Office documents Step 1: Add information to Document Properties What are Document Properties. 1. 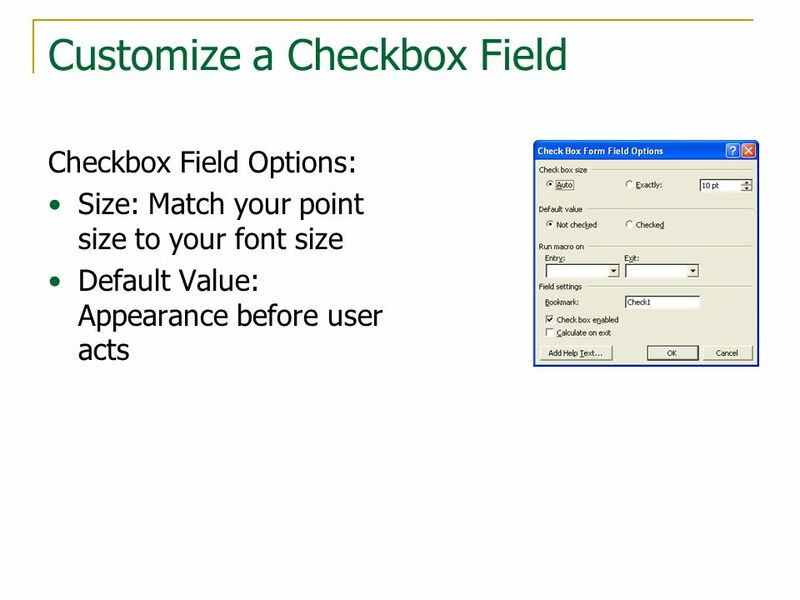 Chapter 29 Creating Forms 3 Understanding Forms Word enables you to create fill-in forms to eliminate the need for storing pre-printed forms. Add. 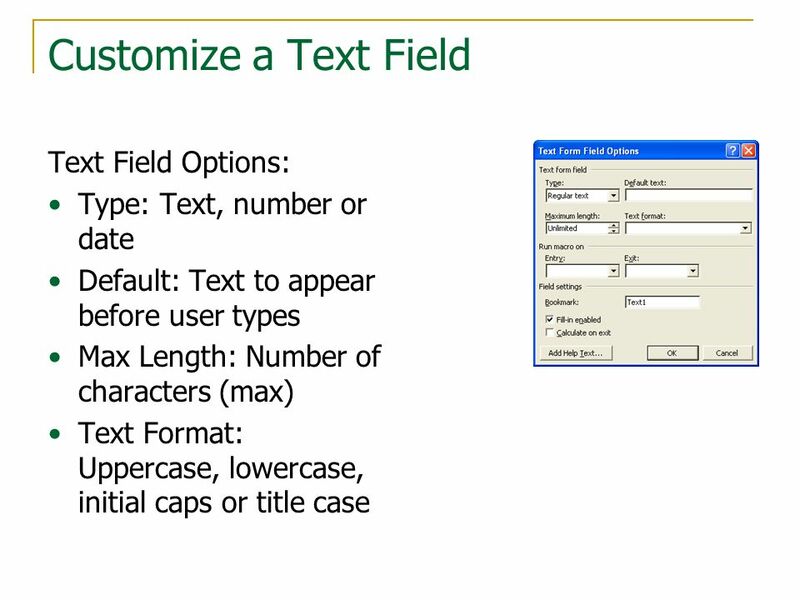 COMPREHENSIVE Word Tutorial 9 Creating On-Screen Forms Using Advanced Table Techniques. Copyright 2002, Paradigm Publishing Inc. CHAPTER 23 BACKNEXTEND 23-1 LINKS TO OBJECTIVES Form Concepts Creating the Form Template Creating the Form Template. Chapter 26. Copyright 2003, Paradigm Publishing Inc. CHAPTER 26 BACKNEXTEND 26-2 LINKS TO OBJECTIVES Create a Form Template Create a Form Template Fill. Course ILT Modifying presentations Unit objectives Create a presentation based on a template and apply a template to an existing presentation Identify. Headers and Footers.  Headers and footers are areas in the top and bottom margins of each page in a document.  User can insert or change text in headers. MODULE 5 WORD PROCESSING. Starting Microsoft Word To load Microsoft Word: 1. Click on the Start menu in the bottom left corner of the screen 2. Choose. Microsoft Office 2007: Introductory Computer Applications 11. Office 2003 Post-Advanced Concepts and Techniques M i c r o s o f t Word Project 7 Creating an Online Form. Microsoft Word Basics. Introduction to Microsoft Word Microsoft Word is a word processor designed by Microsoft. A word processor is a computer application. Pasewark & Pasewark 1 Word Lesson 8 Increasing Efficiency Using Word Microsoft Office 2007: Introductory.